The first of many 2013 updates to beds in our 2012 line! 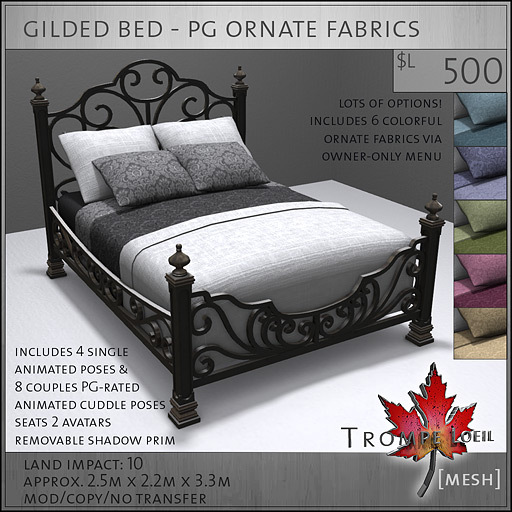 Starting off, we’ve just updated our Gilded Ornate Bed to include all 6 available fabric colors via owner-only menu. No more decisions on which color to stick with! We’re looking forward to updating all our beds to this new texture change menu system, so stay tuned! If you’ve purchased an original single color version of the Gilded Ornate Bed, you’ll be getting an automatic upgrade to the texture change version free of charge! Be on the lookout for a product offer from our vendor system. Updates will be going out on January 15, 2013. If you happen to miss or accidentally discard the update, just drop Cory Edo a notecard or IM inworld with the name of the purchaser, your name (if it was a gift), if the purchase was inworld or on the Marketplace, and the color version you purchased. I’ll drop you an updated texture change copy personally! Its our way of saying “thank you” for making 2012 a banner year for Trompe Loeil!